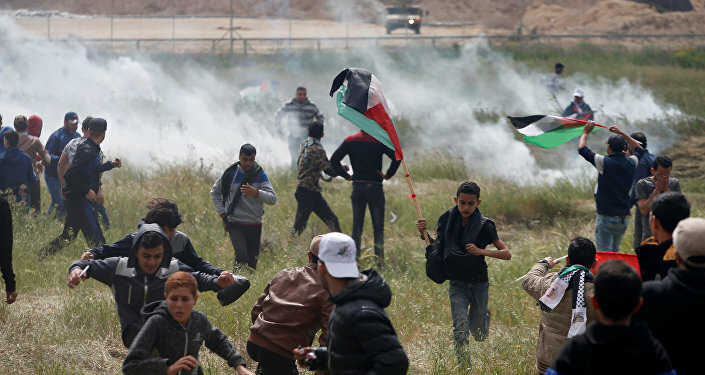 At least 15 Palestinians have been killed and more than 1,500 have been injured in just the first day of demonstrations by Gaza's border with Israel, a spokesman for Gaza's Health Ministry told Sputnik. More than 750 Palestinians were shot by IDF soldiers on day one and another 36 were shot on the following day, Gazan officials have also said. "Palestinians are killed either way. Palestinians are being killed either by bullets in their sleep, in their beds, or by bombs from the air, or by lack of water, or by disease, or they're injured in the bombings and have no access to healthcare," Peled said. "They're also killed when they stand up and resist," Miko Peled, a Jerusalem-born Israeli writer and activist, told Sputnik. "Palestinians are killed all the time anyway… they're killed just because they're Palestinians." According to Israeli media reports, Palestinians are amassing tires — which are typically burned to obstruct IDF snipers' lines of sight — in preparation for the mass demonstration coming Friday. Israel has so far blamed Hamas for organizing 17,000 Palestinians into "rioting" in five spots along the border wall. Reports in Israeli media, however refer to a 20-person organizing effort as comprising "the full range of Palestinian political parties and movements," as opposed to a Hamas operation. "If there was no Hamas, there would still be a march," Peled said. Eric Goldstein, deputy Middle East director at Human Rights Watch, a New York-based NGO, said in an April 3 press release, "Israeli soldiers were not merely using excessive force, but were apparently acting on orders that all-but-ensured a bloody military response to the Palestinian demonstrations." The demonstration calls for Palestinians to be given the right to return to their homeland. Seventy percent of Gaza's 2 million residents are either refugees themselves or descended from refugees, according to The United Nations Relief and Works Agency for Palestine Refugees. The demonstration is expected to continue until May 15, known as Israel's Independence Day, or to Palestinians, Nakba Day. Al-Nakba is Arabic for "the catastrophe." "Although people usually refer to it as something that took place in 1948, it's really a process that began in 1948, which was catastrophic and continues to be catastrophic; it hasn't really ended," Peled told Sputnik. "It's a process that includes genocide and this coincides with the with the definition of the crime of genocide as it is described in the Geneva Convention. It's a process that includes ethnic cleansing and again as it's described by international law. And it's a process in which the Palestinians who remain, who were not killed or forced to leave… live under a regime of apartheid; legalized racist segregation." "We have 2 million people living in the Gaza Strip without access to clean water," Peled told Sputnik, adding that Gaza has never been habitable, though Israel has "herded hundreds of thousands" of people from southern Palestine into it. "There's no access to health care because Israel decides who gets health care and who doesn't… they can't leave to get medical care and [there's] no medical care centers. And of course there is bombing every so often." Jason Greenblatt, the US special representative for international negotiations in the region, denounced Palestinian demonstrators in an April 5 statement, saying the US condemns "leaders and protesters who call for violence or who send protesters — including children — to the fence, knowing that they may be injured or killed." "Palestinians marching towards the fence and wanting to enter and go to the other side is not people trying to infiltrate a border. It's people trying to break away from prison back to their homes and their land. The way this is portrayed is these wild, angry Palestinians trying to take down an internationally recognized border," Peled told Sputnik. "This not a recognized border. It's a prison fence. It's a fence that was built to imprison these people and they have every right to want to break through and on the other side are their homes — their land and their homes are on the other side and they have the right to demand to return there." UN Secretary-General António Guterres said in his own April 5 statement that he "particularly" urges "Israel to exercise extreme caution with the use of force in order to avoid casualties. Civilians must be able to exercise their right to demonstrate peacefully." In order to prevent another similar massacre, Peled says that the international community needs to call for immediate boycotts, divestment, and sanctions (BDS) against Israel. "It needs to send every Israeli ambassador home and call all the ambassadors from Tel Aviv back to where they belong. They need to send aircraft carriers to immediately break the siege on Gaza and provide humanitarian care for the people of Gaza," Peled told Sputnik. "They need to do it without condition and immediately," he concluded.